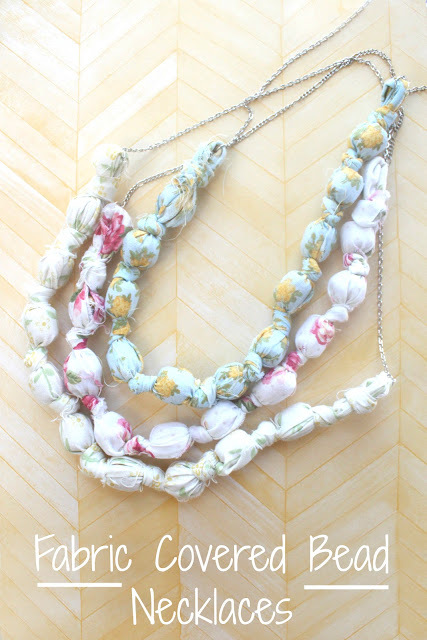 I made these necklaces during the winter because I was desperate for spring. Now it's April, and I'm even more desperate! We had some random snow last week and then it was in the 60's yesterday, so I'm afraid to trust the weather and break out the shorts just yet. I don't know who's getting more impatient, me or my kids. To them, spring and summer has become this magical time when all wonderful things happen: going to the pool, playing at the park, going to the beach, walks outdoors, going to the zoo, grilling, etc. Last Monday the weather was in the mid 40's, so I gave into my kids' pleas to go to a local park. We packed up and got the the park and within 20 minutes, the temperature dropped 15 degrees and it began to snow. The trip ended up with a visit to Starbucks for hot chocolate (which is always a good idea anyway, but not exactly as I had planned it.) I keep reminding myself that once summer comes, I'm going to be glad that I'm here in the 70 degree weather rather than back in Memphis with the 107 degree heat. These fabric and bead necklaces are a way to bring a little spring into your wardrobe without having to sew a stitch. 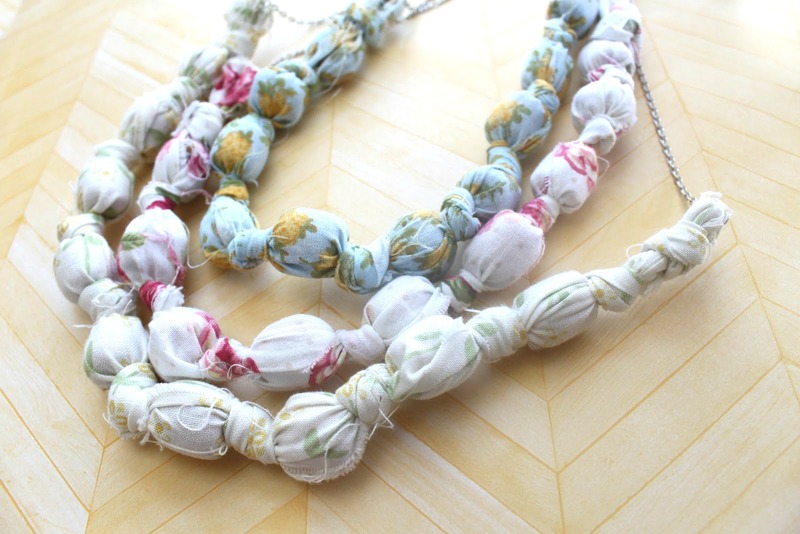 SUPPLIES: 38 inch long fabric strips (choose fun florals for springy necklaces), wooden beads, 14 inches chain, 2 jump rings. rotary cutter and mat, round nose pliers. TWO: tie an overhand knot at one end, concealing the raw edge of the fabric. 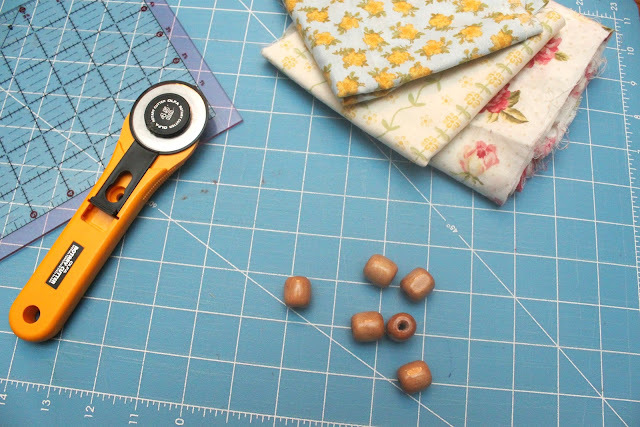 THREE: open up your fabric "tube" and insert a wooden bead. FOUR: tuck the fabric around the bead to enclose and tie a knot. FIVE: continue inserting beads and knotting. 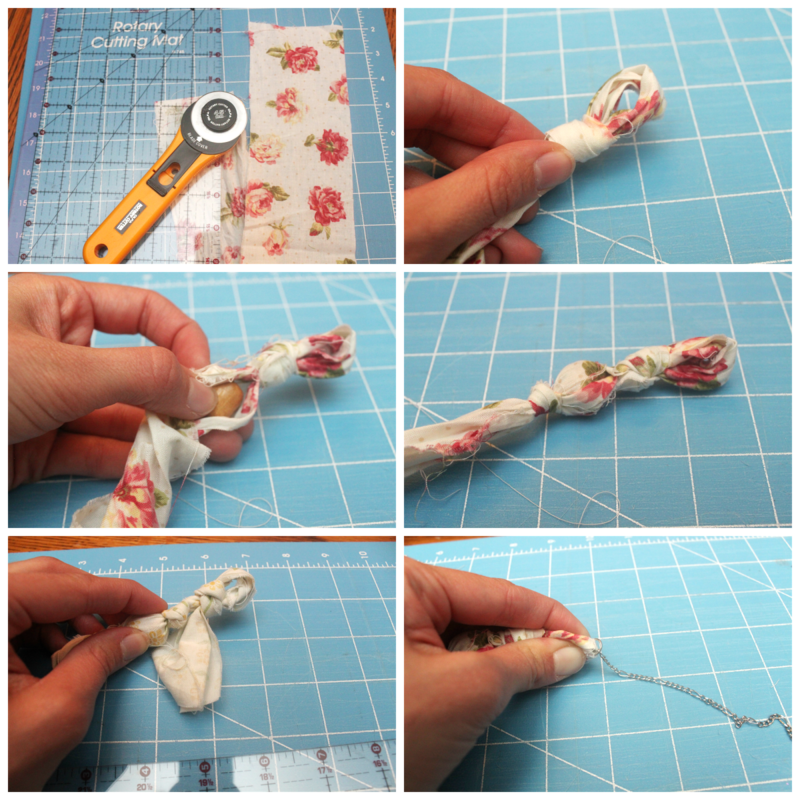 If you need to add more fabric, simply overlap the ends of your fabric strips and continue knotting as usual. Once you have 6 inches of fabric left, tie another overhand knot and cut any extra. SIX: using your round nose pliers, attach a jump ring at each end of your necklace and add your chain. I made my necklace long enough to go over my head, but you can add a clasp too if you prefer. Enjoy your new springy necklaces! P.S. I guess we were channeling similar crafty brain waves because Kate at See Kate Sew also made cute fabric and bead necklaces! Check hers out HERE. These have such a romantic spring vibe to them! Really nice. Thanks for the tute!! Very cute necklace! I love it! I would love for you to share this on my weekly link party Blog Stalking Thursday. Thanks for the inspiration! These are fab! Pinning these! Thanks for linking this up with Moonlight & Mason Jars Monday! We'd love an add to your link party page if you'd be so kind. This necklace is GORGEOUS! I am in love! I would LOVE to have you share them at my link party going on!! New facebook follower here! I love this idea! They are gorgeous! Thank you SO much for linking this up to our very first Moonlight & Mason Jars Monday! We absolutely love this project... It is just so cute! We hope you'll link up again tonight :) Have a happy Monday! I love this idea, and the soft looking pretty fabric you chose. Thank you. I'm your newest follower.